First of all, I must give some big props to my local guy. 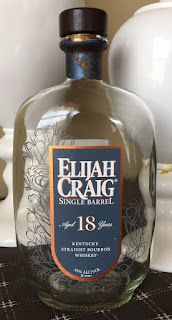 On a random wine run to my corner shop for my wife, he let me know as I was checking out that they got in a bottle of Elijah Craig 18. "You want it?" he asked? I was so excited I had to refrain from doing the Night at the Roxbury bit ("No . . . . . YESSSSSS!!!!). I loved last year's release of the 18-year, and I couldn't wait to try this year's. I actually cracked it open as my New Year's Eve pour. Due to extenuating circumstances that night (there may or may not have been some drinking involved), I didn't end up taking any notes of those first few pours. And I didn't get back to this bottle until weeks later, so my first real impressions were after this bottle had been open and given a chance to sit for a bit. What I loved about last year's release was that it had a very nice blend of that dry, woodiness from the extra aging, but it was balanced well by its sweetness. My first impression of this release was that it lacked the sweetness of last year's release. The nose on this one is beautiful, heavy on the caramel, but also giving off the expected wood notes as well as a nice walnut note. It actually smelled sweet, like a walnut pie, or at least how I imagine a walnut pie would taste. The taste is mostly just an oak bomb. The dry wood notes overwhelm. Buried underneath all the oak other flavors are hidden, however. There's a distinct nutmeg flavor, as well as a hidden vanilla flavor, though certainly not a sweet vanilla. Interestingly, as I made my way through the bottle, the oak notes seemed to take a step back. I don't know if that's a result of the bourbon having had more time to breathe, or if it was just me getting accustomed to the flavor, but I began noticing other flavors as well. It had a slight cocoa flavor to it, and at times seemed to take on some red wine notes, kind of like a spicy, woody shiraz. Those wine notes seemed to go perfectly with the velvety texture of the bourbon, and I really began enjoying each pour. Additionally, it did seem to sweeten up each time I went back to the bottle, such that by the last glass I found myself really enjoying it and wishing there were more to pour. 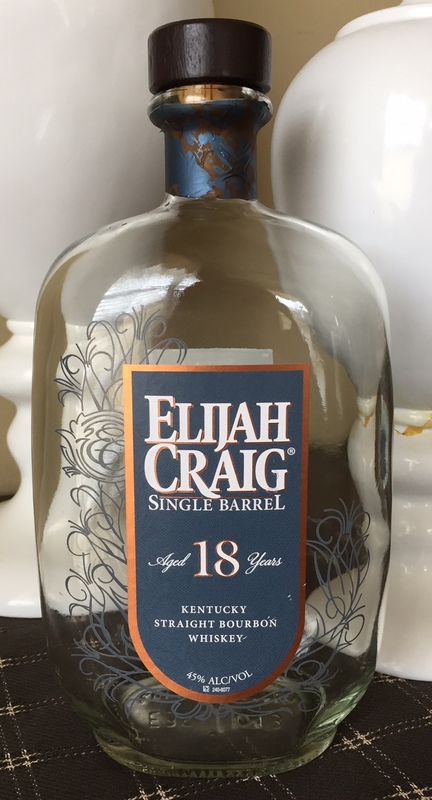 By the end, it was an incredibly sweet, complex bourbon, having the heavy oak, but well-complemented by the underlying vanilla and dark fruit notes. All in all, this bottle comes with a hefty price tag and a lot of time in the barrel. While the nose was amazing throughout, I didn't find myself REALLY enjoying this bottle (at least not $130-worth of enjoyment) until the very end. Perhaps it would serve well to be decanted, but I was a little disappointed with this year's release. While still very good, I expected much more after last year.